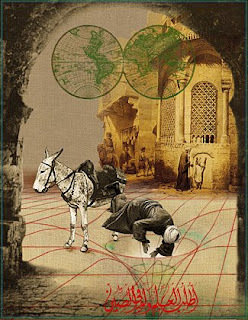 One cold November morning, the wandering of the mysterious dervish Shams, who walked in a field of magnetism, brought him to the front of the Shekerjiler Hani (Inn of the Sugar Merchants) in Konya just as Mevlana Jalaluddin Rumi was passing. 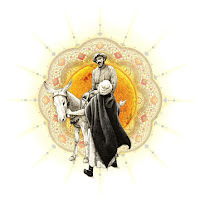 Mevlana Jalaluddin sat majestically on his horse as his students scrambled to walk beside him and hold the stirrup. He had just completed his class at the College of Cotton Merchants. Shams leapt from the crowd, grasped the bridle of the horse and shouted, "O teacher of the Moslems, who was greater, Abu Yazid Bistami or Muhammad the Prophet?" Rumi felt the eyes of Shams looks past his own into the essence of his being, causing rivers of energy to flow within his body. "The Prophet Muhammad was greater," replied Rumi. Then Shams said, "Did not the Prophet say, 'We have not known Thee as Thou deservest to be known,' while Abu Yazid exclaimed, 'How great is my glory; I am exalted; my dignity is unpraised; I am the sultan of sultan'? Mevlana answered, "Abu Yazid's thirst was quenched after a mouthful, but the Prophet of God sought for water, thirsting more and more. Abu Yazid satisfied himself with what he attained in God, but Muhammad the 'Elect One of God' sought each day further, and from hour to hour and day to day saw light and power and divine wisdom increase. That is why he said, 'We have not known Thee as Thou shouldest be known.'" Shams cried to God and fell to the ground. and the two men embraced. They left the questioning students and retired to a retreat cell where they remained for three months occupied with the exploration of awakening. They became their own planet. Rumi the earth, Shams the sun. Lost in God-consciousness, they experienced the ecstasy spoken of by the Sufis. Here within the stone walls of a small domed chille (retreat house) was a friendship based on the discovery of God through each other at a time when both beings had a lesson to impart to one another. These beings, face to face, saw within each other the grace and presence of the essence of what each was searching for. For the first time each could reveal to another being the secret in his heart. Rumi was like a room filled with God-love. Shams saw this and opened the door. As they meditated on the Beloved, sounded wasifas (Names and Attributes of God) and the zikr (la ilaha illallah), the air in the small hut was made pure by the breath of these two holy beings.